A crunchy medley of grilled vegetables with pasta garnished with cheese. Feel free to experiment with a choice of veggies. Image is for illustration purpose and may not be of the actual dish. 1. Heat a large pan of salted water over medium flame. Cook the pasta until al-dente, drain and keep aside. Reserve some of the pasta water. 2. Combine the capsicum, eggplant, zucchini and onions in a bowl. 3. Add salt, oil and black pepper powder. 5. Grill the vegetables on a preheated grill or grill pan for 10 minutes or until the vegetables are lightly charred and tender. 6. 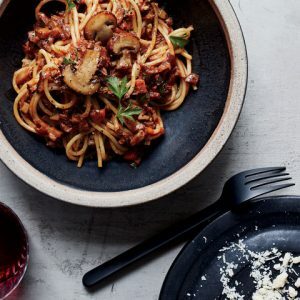 Remove the vegetables and transfer to a pan with tomatoes and pasta. 8. Garnish with cheese and mint leaves. 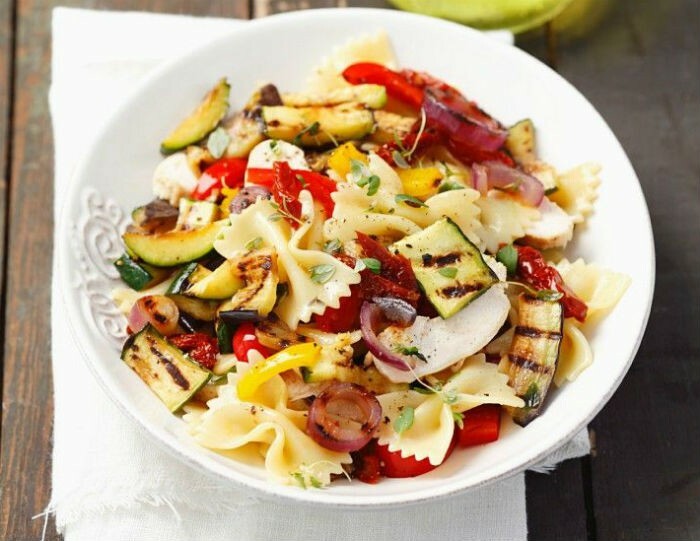 Feel free to comment or share your thoughts on this Farfalle with Grilled Vegetables Recipe from Awesome Cuisine.